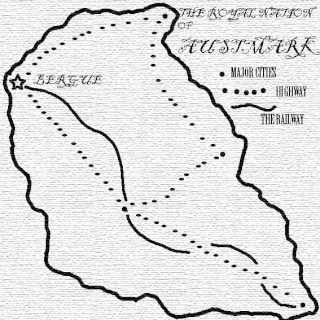 It Is 1857 In Austmark (this world is not dissimilar to our own). It is dark times, the king, Alfonse is sickly, possibly by poison or witchcraft and his youngest son, Caspian wishes to take the throne over his brother, Alwen, the crowned prince. Caspian will use whatever means possible to take the position of power over his two brothers, the aristocrats of the realm have been gifted, bribed and blackmailed into alliance with him. A troupe of carnie folk have taken up residence on the ouskirts of the poor sector of the kingly city of Bergue and the country is going into a state of decline as the country looses its leader. Within this quirky and confusing counrty there are many movements in the advance of science, creating rumors of raising the dead, mixtures of sciences with religion, creations of new weaponry, revolution in black powder technology and electricity. As science advances magic is not declining, there are elementalists, described in the orient as Fire, Water, Wind, Earth and rarely Wood. This RP has all of the characters developed by me and you will RP them, this is a RPing experiment so that you control characters you cant change too much to suit yourselves. This is a tale in quirky gothic times, humor is acceptable but please no slapstick. The general rules apply, if you have questions PM me. Effects: A pistol wrought in silver. Description: Almost always wears a ¾ length black woolen coat, with a deep red lining. Ignatius is wealthy and has a range of formal clothing and several hats. Personality: Ignatius is a bit of a showman from his fame as a vampire slayer, he loves to joke and tease with his ability to control flames. History: Ignatius has appeared in the kingdom, no one knows anything of his past. Effects: Carries a rifle and a saber. Description: An old man with an enormous white moustache, he always wears his blue military coat with a red strip and gold tassels. Personality: Stubborn but very loyal to his king, likes poor jokes and doesn’t like funny magic business, nor illusions! Likes to tell tales of his childhood. History: At the age of 13 Alex joined the army of the king and quickly rose in the ranks till he became directly responsible for the king, as the king is dying he feels less welcome in the palace and has been sent to help fight the supernatural in the kingdom, and keep an eye on the king’s youngest son. Effects: An amazing pack of purple, blue and gold cards that have both the ability to trick people and cut things with their razor sharp edges, Eugene carries many more illusion props. Description: Thin tall dark haired man with pronounced cheekbones and a definite presence, Eugene wears a suit of dull purples and greens. Personality: Egotistical, loud and attention seeking, Eugene is well spoken and knows every trick of hand and can divert almost any audience’s attention. History: Eugene has travelled as far as the orient in research of his skills and has recently caused trouble in the kingdom, thus looking for alternate employment. Element: Subtle control of the rare wood element, this only extends to the gauntlet and other objects he touches. Effects: A repeater crossbow that is a part of an ingenious gauntlet on his left arm, the crossbow and retractable blade is all controlled with Aiolos’s fingers. Description: A slight man with wiry muscles and not too much height, his eyes are black and his visible skin is pale, he wears tight fitting dark hide all over his body, a cloth hides his lower face and a dark cloth hood his hair and upper face, only his eyes are visible. Personality: Aiolos is a sharp tongued man who will taunt with no thought of punishment, as few in the realm could catch him and his super-human acrobatics. History: As Aiolos tells it he was bitten the previous winter, close to death a vampire came and fed on him leaving little blood as the vampire was chased out of town by a silversmith, the smith, knowing the thirst of vampires slaughtered a pig and fed him the blood, mixed with silver powder from his workshop and several other concoctions. The smith gave Aiolos his life and suppressed his vampirism to a large extent. Aiolos has joined to use the strength imparted by the creature of the night against its kind and thus stop more humans being infected. Element: Earth-metal major- None in wolf form. Effects: Lloyd carries a large blacksmiths hammer. Personality: Depressed and bitter about his affliction, bent against Lycans. History: Lloyd used to be a blacksmith but after being bitten by a lycan, when the moon was its strongest, he lost control of his wolfishness and murdered his family. Effects: a walrus ivory cane with an enormous ‘diamond’ on top. Description: Blonde hair, fair skin, bright blue eyes, wears a short white coat over fancy white attire. His boots are also white. Personality: Claude is a charmer, he is very good with the ladies and has no shame, but his superiority complex causes many males to dislike him. In combat he is smooth and collected as he cannot panic, ever. History: Claude comes from the north, his family had a curse put on them by a , Huldra, a ‘loop hole’ in the curse allowed Claude to live without a heart, Claude has moved south to seek the company of women, lots of women. 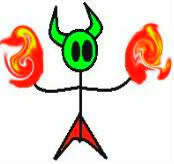 Element: He can BEND fire in ‘daemon wrath’ but generally cannot use any. Description: Wears a top hat to hide his horns and bald head, his skin is almost transparent and the veins are visible. He wears a black tailcoat over a suit. All of his clothes seem just a bit too small for his huge figure. Personality: A freindly guy, despite constant judging and looks that he receives due to his appearance, Asmodeus is scarred by the fact that he is the son of a daemon and would stop at nothing given the chance to slay his daemonic father. History: A daemon raped Asmodeus’s mother leaving his seed in her, after the bloody birth his mother left him on the street in a hope that the evil being would die in the bitter cold of the winter, a young tailor found the baby and saw him, not as daemon-spawn, but as a defenseless child. This tailor raised him he aged very slowly and eventually Asmodeus was able to care for his adoptive father, this caring young man never had any biological children and is now old and arthritic. OOC: remember people to stick to your character as much as possible, if you have a Q ask me. If you feel like a different entry, uber I'm looking at you you may, not everyone needs to meet him at the well, i want to keep this RP real-ish so keep your characters to their psychology don't wait for prompts or for me to make decisions. Characters can and will die throughout the story. Lloyd stepped out of an alley several yards behind Ignatius, as it was quicker than taking the streets. He studied the man from behind and knew he was who he was looking for. He walked up to him and looked down at him. Though not trying to intimidate, he generally did, and there were now no children in this street. "Ignatius Aldebrandi?" he growled, "Lloyd Whelan. Blacksmith. Werewolf." He more snarled the last bit than growled, his distaste for his affliction evident. "Good day, to you my dear wolf, i fear i have been paid by the king to slaughter...or cure if there is a means, your kind, so what is it that you seek from me?" Ignatius said smartly noting the ornate silver bands on the mans thick wrists, very happy that this man had scared away the bothersome children, but he doubted this infected man that seemed of simple means to be of any help to him, unless they were fighting vampires that was... "I apologies for the bluntness of my words" Ignatius said formally as he raised a hand "Aldebrandi, Ignatius Aldebrandi i am the slayer of the supernatural and keeper of the peace" Ignatius introduced himself keeping a close eye on the behavior of the infected....blacksmith? "I will hear you out but i wouldnt start blurting out your ailment in public like that otherwise it would be my duty to...you know..." Ignatius said with a twisted smile and a flick of flame. "Do your worst, I'm sure I could stop you rather forcefully if you tried." He said, still growling, but now more human than before. The knowledge that he would have to kill werewolves after accepting this pleased him. "And about talking about my ailment in public, look around. No-one stays close to me for long, unless they want something sharp and metallic fast. I'm here about those posters you've put around the place. You're looking for a group to help slay monstrosities. I'm in." "Your, wolfish-ness? is it controlled or will you be taking a couple of nights off work a month?" Ignatius asked casually predicting the answer "you say your a blacksmith? This is an interesting career change. When more gather i shall get you to sign the contract, and believe me it is a contract that works well for you" Ignatius smiled once more hoping that he wouldn't be just a duo with this begrudged wolf man. OOC: you can have your character just walking around and be approached if you like i cant wait to get this on the move. "I'll need a couple of nights off a month, but that's three weeks away, we'll think of a way to sort that out by then. That is assuming that we get some others to join us. It has been over an hour since you had planned to meet people here." Lloyd pointed out before going into an all to natural silence as he waited for something to happen. He was looking forward to this, whether he will die or not, as dying would be better than being a werewolf who'd killed his own family, and if he didn't die, then just maybe he would get the one who bit him. Drake leaned against a wall in a dark alley with a good view of the courtyard and the well. The fire show had been interesting enough, but now the pompous-looking man was speaking with some burly man who had approached him for no apparent reason. Fiddling absent-mindedly with his wrist, Drake watched the conversation, only barely able to make out some of the words spoken. 'Some sort of gathering, eh?' Drake thought. That was interesting enough. Strolling slowly from the safety of the shadows, Drake approached the two men. "I understand you are putting together some sort of party... the adventuring kind, obviously. Mind if I tag along?" The last sentence trailed off slightly as Drake noticed the uncovered hand was turning uncomfortably red and had begun to sting. It was quickly covered as Drake looked back at the two men. Eugene was doing his routinne as always in a little corner, when all of a sudden all the kids around the plaza ran away, or their parents grabed them and run. Eugene got pissed "Ingrateful people, one kills himself putting up a show and this is the thanks tha you get" he grabed his stuff and moved out into the open, he looked around and noticed a man with fire in his hand, a big man and a pale man, without giving it a second thought he said in a low tone"these imbecils, they were the ones to sacre away my clients" he moved up to them, arms crossed and his view gassing towards the floor "good night! gentlemen... well actualy not that good at all" he said giving a small chuckle " you seemed to have scared my clients away! and when I don't have clients I don't have money!... so you know where this is going, so if you will so kindly take your bussiness to another place there won't be any problems"
"Sure, a couple of nights a month should be fine, especially if you are the only member of my gathering..." Ignatius was about to smile when his eyes met the black irises of a small framed man that seemed to just appear from the shadows of a gloomy side street . "Yes a gathering, of sorts, i shall wait for more to arrive before i enlighten you on the matter" Ignatius answered his green eyes focused on the black eyes of the newcomer, flicking them for only a second when the man grabbed at his ruddy hand. I have no shortage of money my dear illusionist ,so how about i become your client, and you will then be part of my business and we shan't have to move. Can you fight or are your hands too delicate for rough work?" Ignatius smiled mockingly. "Well, you be the judge of that my friend" Eugene the snaped his fingers and a strong wind felt all around him, he then moved his left arm from right to left an cards started to pop out and started to hover around him "you see my friend, this cards are half entertaiment..." he then pointed his hand to a nerby wooden bench and the cards flew, terring it appart "and half for death" then the cards return to under his sleave. Drake scoffed. "An impressive parlor trick. You forgot one thing, though. I've seen your show." Moving over to the bench, Drake's hands stroked along where it used to be, and it reappeared with a card sized hole in the wood. "Impressive enough, but don't try to make friends by exaggerating your skills. It makes people think you're full of yourself... not that many people would be wrong in your case." Ignatius chuckled in a controlled way at the practiced drama of this man "Your slight of hand could be useful to me and your showmanship could be entertaining..." Ignatius paused waiting to see if anyone else would join the bizarre assortment of men that had met at the well "What do you all know of vampires, lycans, trolls and the like?" OOC: not everyone has to know everything as a good rule of thumb "needs one to know one" but you don't have to tell the whole group that you carry an infection. Drake shrugged. "On the whole, They are a blight on the world. There are the select few who manage to resist their afflictions, but they're rare." "AH! you may have seen my show, but you have never seen me dance the Ballet of Death and Illusion, that my friend, is what I call my 'Grand Finale'" Eugene told the pale guy with a ginning smile on his face " now for your question my friend, all I know that they are freacks of nature, don't know why can't they just live someplace appart from us"
Lloyd may have looked big and only there for muscle, but he was smart. For a werewolf. "From what I've heard, trolls are big, slow and stupid, but very tough. Vampires are strong, smart and fast, but for the most part they deserve to die." This was the werewolf talking, as before he was bitten he didn't hate any of the supernatural beings more than the others. For some reason he had taken an instant dislike to Drake. He tried to hide it, as hating someone for no reason was unkind. "Werewolves are more or less harmless most of the time, but two or three days around full moon they become incredibly hostile and most if not all of them can't control it." Eugene made a small ball of air below the scroll making fly his way, he moved his arm up to his chest, his hand ending around the area of his pocket, sudenly a pen pop up and he grabed it "let's see, so you give us accomodation, more money and protection, don't see how I'm going to be allowed to be killed with an offer like this" he then proceded to write his name "Eugene...Charlotte... there that should do it, any other takers" he said eyeing the other 2 guys. Lloyd stepped forward and took the sheet from Eugene's hand, quickly read the contract, pulled a pencil from his pocket and signed his name. "I don't think you'll get this full," he said to Ignatius as he handed it to Drake (yeah, he hasn't asked yet, but if Drake don't wanna sign he can pass it on), "then again, you won't need to." he grinned, revealing somewhat larger than normal teeth, the canines protruding just a bit further than is normal. A pen shot forward from Drake's sleeve into his hand. "Sounds exciting enough. I've been bored to death in this backwater town... not there are many other types of towns in these parts." Aiolos Drake was soon written on the third line down in flourished cursive. The paper was then handed back to Ignatius. "That it, then?" "Yes that is it, now you will see a tree and a tower over there?" Ignatius said nodding toward the rich district palisade "until that document was signed i could not tell you where it was and because i hadn't told you, you couldn't have seen it!" That is a nice little complex that i bought off a man who seemed to know the complexities of magic." I will show you how to enter through the doorway Ignatius said as he gestured for his new gathering to follow him into a darkened gap between two buildings "There is a door here" Ignatius stated to the others, and he was correct, the door hadn't seemed to be completely noticeable till it was mentioned. If you tell someone who isn't on the contract how to get in then i will have to have them, and you killed" Ignatius said with a grin as he opened the door into a snow covered courtyard with three buildings in it. "Quite interesting, this..." Drake commented, gait shifting slightly, gracefully stepping over patches of snow. Drake reached the center of the courtyard, stared up, and spun slowly, taking in the view. "Good buy, I'd say!" "I do agree with you, especially considering the underground section, that connects to the sewer system" Ignatius grinned almost boasting "The bedrooms are in the tallest building the kitchen is in that one there" Ignatius gestured "And the final room is the workshop and prep room....My room is at the top of the tower, id prefer if you didn't ever come in, especially when i am not there" Ignatius said casually "the other rooms are first there keeps it" Ignatius stated hoping for a hint of competition between this less than friendly group "If you have fam... someone who should be seeing you or might miss you tell them that you have found work as something mundane and you wont be able to see them often, if you have a lover, tell her nothing and if possible try to end it, i pay well but i expect a lot....go for it explore your new home"
Drake entered the lodgings, instantly claiming the lowest one. "Nice and dark. Much easier to sleep without that meddlesome sun waking me up suddenly."